Minute and twenty seconds remaining in the third quarter, Celtics up by 20 points, time-out Lakers. Kobe grabs a towel, looks toward the camera, and THERE IT IS; Kobe face. Watching his teammates get absolutely throttled for an entire quarter has Kobe reminiscing about the days when he would drop 50 a game for seven straight games and have no idea who the other four guys wearing the same jersey were. 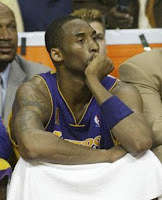 It has Kobe wondering if he can beat the Celtics four times, by himself. Gone is the Kobe who was laughing with Luke Walton and high-fiving the guy Phil Jackson still calls Vlade. Arrival is the Kobe who destroyed his teammates confidence in practice and obliterated it on game day. Kobe face, it's an "Incredible Hulk" like change in personality and it might just be back after the Lakers 3rd quarter embarrassment Sunday night. The bad thing about Kobe face is that the Lakers were a quick first round out when it existed. The good thing about Kobe face is that it leaves no doubt who the planets best basketball player is. Some may wonder, what is it that creates Kobe face? I can't answer that question but I can assume that Leon Powe throwing down five uncontested jams over Pau, Vlade, and Stoli doesn't keep Kobe face at bay. 1. The Celtic bench is loaded with quality bench players to fill every roll possible. From Leon Powe and P.J. Brown to James Posey and Eddie House, the Celtics have backups with experience and backups that provide energy. If Perkins is in foul trouble P.J. might even be the better option. If Rondo is playing poorly and needs a blow Sam Cassell is a serviceable veteran point. If Allen or Pierce are in foul trouble early or get injured, James Posey plays solid defense and can hit the big shot. Leon Powe and Glen Davis provide energy combined with power inside. Even though Davis and Eddie House haven't been used as much, both can be excellent off the bench against this Laker team, this Laker team that plays a shall we say sub par defense. Last night being a perfect example of how successful the Celtic bench can be, starting center Kendrick Perkins played 13 minutes picking up 4 fouls, the fix was for Powe who put in 21 points. When the Lakers sit Kobe, the Celtics roll. 2. 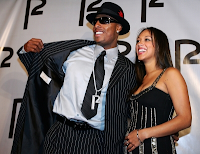 The TRUTH is you can't stop Paul Pierce. Boston rotates tremendously well against a talent like Kobe Bryant. They put 2 and 3 guys on him each game and force him into taking shots while he is falling away from the basket i.e. low percentage shots. Pierce on the other hand looks at Vladimir Radmanovic, licks his chops and knows he can do what he pleases when he pleases against him. If Paul wants to roll off a screen and drill a three ball, Radmanovic is two steps behind him. If Pierce wants to make a fake then take him off the dribble, Radmanovic is clueless as to how to defend it. Showing up late against Pierce making a move to the rim will undoubtedly result in him taking two shots from the free throw line. Aside from the obvious, do you have ANY DOUBT that Pierce feels so confident in his shots, his ability to get to the line, and his teammates that you can't defend him right now. The TRUTH is, someone wants to shake himself of that label, "longest tenured Celtic to NOT win a ring." That won't be his legacy. I'm still picking C's in six . . only way that changes is if the Lakers win 3 in Hollywood.